WELLINGTON, New Zealand (AP) — One match that wasn't played carried more significance than five that were in the fifth round of Super Rugby. The scheduled match between the Crusaders and Highlanders in Dunedin was canceled on Saturday by joint agreement in a mark of respect for victims of a mass shooting the previous day in Christchurch. On Friday afternoon a lone gunman opened fire at two mosques in the South Island city and in less than 30 minutes left 50 dead and dozens wounded. Crusaders chief executive Colin Mainsbridge said players were shocked by the events which had taken place in their own city and "all other issues and considerations pale in significance" against the loss of life. Highlanders chief executive Roger Clark said the match — a derby between teams from New Zealand's South Island — is usually one of the biggest events on the Dunedin sporting calendar and more than 20,000 were expected to attend. "But when we think about the massive loss of life and absolute devastation that has been wreaked on people in Christchurch, we feel this is the right decision." The match was declared a draw with each team awarded two points. 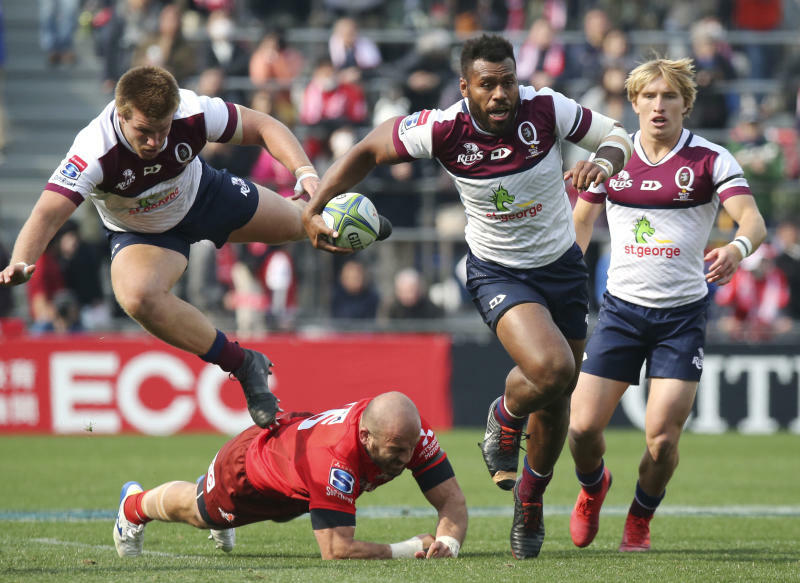 With the champions out of action, South Africa's Lions and Australia's Queensland Reds staged second-half comebacks to win their round-five games. Gianni Lombard landed an 82nd-minute penalty to seal a 36-33 victory for the Lions, who rallied from a 33-5 deficit in Johannesburg. 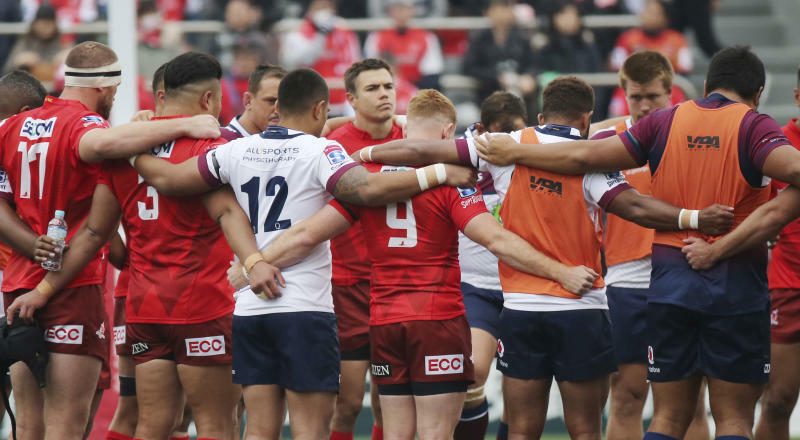 Flyhalf Hamish Stewart kicked a last-minute penalty as the Reds recovered from a 16-point deficit to win 34-31 against the Sunwolves of Japan. 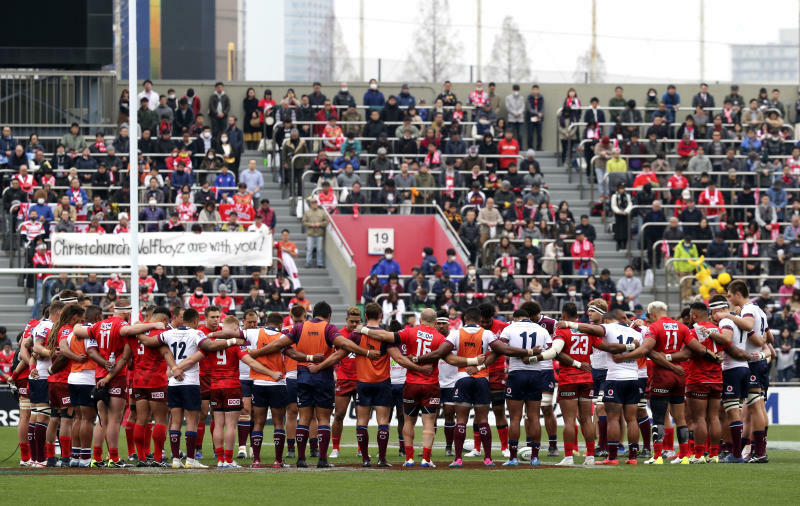 Before the match in Tokyo, players from both teams linked arms in a circle for a silent tribute to the victims of the Christchurch shootings. Events in Christchurch, an attack by a white supremacist on Muslims, have drawn new attention to the rugby franchise's name "Crusaders" — with its connotation of a religious war. In a statement Sunday, the Crusaders defended the use of the name, saying it had no connection to the Crusades, the military expeditions organized in Europe from the late 11th century in which Christians and Muslims battled for sites in the eastern Mediterranean that were considered sacred to both religions. "In terms of the Crusaders name, we acknowledge and understand the concerns that have been raised," the statement said. "For us, the Crusaders name is a reflection of the crusading spirit of this community and certainly not a religious statement. "What we stand for is the opposite of what happened in Christchurch yesterday; our crusade is one for peace, unity, inclusiveness and community spirit. This team and the wider organization are united with our community in standing against such abhorrent acts as that which occurred (on Friday) in Christchurch and in standing in support of our Muslim community." But since their inception in 1996, the Crusaders — who have won the Super Rugby title nine times — have used in their pre-match entertainment three knights on horseback who wear crosses, emerge from a mocked-up castle and ride through the team's Christchurch stadium brandishing swords. The cancellation of Saturday's match marks the second time a Crusaders' season has been severely disrupted by a tragedy in Christchurch. In February, 2011, a 6.3 magnitude earthquake struck the city, devastating its central business district and leaving 185 dead. The Crusaders' home ground, the former Lancaster Park, was damaged and later condemned and torn down. For the remainder of the 2011 season it played home matches at Nelson, Timaru and Napier before finally returning to Christchurch, to a new a stadium, the following year.